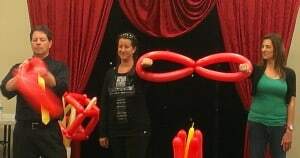 Colorful 3-foot balloons twirl about captivating audiences and transform participants into stars. With every twist of the wrist, a swirl of a balloon and funny pun uttered captivates the audience like a Pied Piper playing a tune. PHOTO OPPORTUNITY AFTER THE SHOW TOO! Turn the house lights off and hears the oohs and aahs from the audience as glowing balloons twirl about the room.